Gaining weight comes natural along with the menopause and most women accept this because they think that there is some kind of a connection and that these two come hand in hand. The cause of the weight gain around the middle area of the body is unknown to them. They think that this fat cannot be removed, but the truth is that it can be eliminated. Menopause causes joint pain, mood swings, hot flashes and other problems along with the weight gain. Women should not be concerned about this since it is all natural. Women usually gain from 10 to 15 pounds during the menopause, so this states that a woman gains one pound during every year of the menopause. 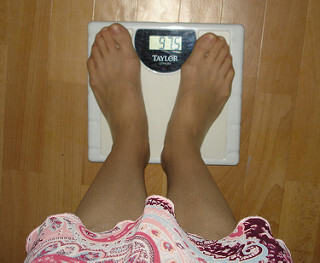 The cause of the weight gain is the body's adjustment to the hormone production and other menopause elements. The number of the produced reproductive follicles during the menopause decreases and they become useless once the menopause ends. So this will result in the reduction of testosterone, progesterone and estrogen production, which will cause weight gain. Testosterone and estrogen are responsible for the weight gain; estrogen - once the estrogen levels are lowered, the body will manufacture more fat since fat is the supplier of the estrogen, and in this way, the body is trying to balance the level of this hormone in the body. Testosterone's low levels will decrease the metabolic rate and so when we are resting, we will burn fewer calories. This will affect the distribution of fat around the body. Shape of the body can thus be changed from the apple shape to the pear shape. The body can be changed due to the deficit of two mentioned hormones. Buttocks and limbs are not prone to fat among males. Their fat tends to stay in the midsection of the body. However, women do not develop fat in the midsection, but in the upper arms, buttocks and thighs. Once the woman enters menopause, the fat locations will be altered due to the change of the androgen-to-estrogen ration in the body. Androgen, which is a male hormone, causes the fat to form around the midsection and this is why women experience this change. How to Stop Weight Gain? Certain solutions area available, but you have to know that results will not come as fast as you may like. Short-term solution can be found in the form of the HRT, or the hormone replacement therapy. Still, you should know that you will start to gain weight when you stop with the therapy. You can consume smaller meals and exercise every week for 3 to 5 times. Always include resistance training and be careful about the things you eat. Start your program today and results will be visible after a while. Quitting Birth Control Weight Gain - how can I stop that?